Greylag geese on the Cloudy Pit meadow. Observation - Greylag geese on the Cloudy Pit meadow. - UK and Ireland. 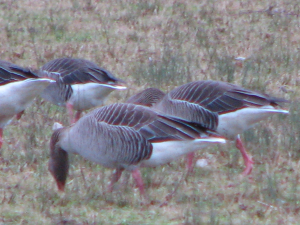 Description: I counted 150 Greylag Geese and 1 Canada Goose all parading round and honking loudly. I counted 150 Greylag Geese and 1 Canada Goose all parading round and honking loudly.